Dynaflex Sports Surfacing offers a full line of sports surfacing products for tennis courts, running tracks, basketball courts, playgrounds and other recreational surfaces. 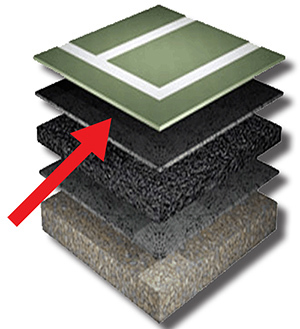 Whether building a new court or restoring one, Dynaflex offers a complete surfacing system for all projects for tennis courts, running tracks and other recreational surfaces. play and foot traction desired. Dynaflex can be formulated in custom colors to meet LEED green building requirements. Superior bonding capabilities of fiber-reinforced, premium acrylic resins results in a longer lasting playing surface, providing up to 50% greater flexibility and wear than conventional clay filled coatings. High solids composition assures a homogeneous mixture for a smooth, even-textured surface, providing sure footing and predictable ball bounce. Surface is abrasion resistant, preventing ball discoloration. A unique ultraviolet light stabilizer provides long lasting color protection from harsh weather and intense sun, even in tropical climates. An advanced blend of surfactants ensures compatibility and superior adhesion to new or existing asphalt or concrete sports surfaces, providing a uniform, long lasting, colorfast coating. Pure inorganic pigments are blended in a high energy process which assures rich, true color for years of service. Consistent quality control color matching at the factory assures uniform non-chalking color.